The Karen Women’s Organisation has criticized the decision by the Karen National Union to suspend its membership from the United Nationalities Federal Council last month, claiming the decision was made without proper consultation with the Karen community. Speaking exclusively to Karen News, Naw K’nyaw Paw, Secretary of the KWO, said that the decision came as a surprise to many Karen leaders, including within the KNU itself. 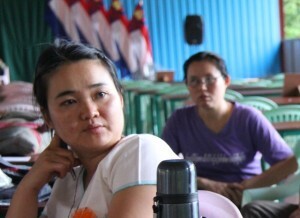 “Many KCBOs are expressing concerns about the KNU walk out from UNFC Congress and its suspension from the UNFC and they have demanded more transparency about how these decisions were made,” she said. General Secretary of the KNU, P’doh Saw Kwe Htoo Win, was quoted in an official KNU press release on September 22, as saying that the KNU Central Standing Committee had already decided that it would leave the UNFC if the KNU’s reform plans were not accepted. “The KNU delegation to the first UNFC Congress in August 2014, spent three days trying to convince the assembled delegates of the need for reforms. Having failed to do so, the delegation led by KNU President General Saw Mutu Sae Poe decided to implement the next step in the KNU’s strategy – temporary suspension – and reported back to the Central Standing Committee to re-affirm the decision to leave the UNFC,” the KNU statement said. In its statement, the KNU claimed that it withdrew from the UNFC to ensure that Karen people could remain in control of their own destiny and that the decision had been sanctioned by the majority of Central Standing Committee (CSC) members in an emergency meeting held on August 22. Naw K’nyaw Paw said that the KNU’s claims that the decision was made following discussions with the majority of the CSC members were simply not true. The KNU decision to withdraw from the UNFC has proven divisive, with community leaders and analysts both criticizing and supporting the decision. Those in support of the decision have argued there was no need for the UNFC because there is already a Nationwide Ceasefire Coordination Team (NCCT), which consists of all of the members of the UNFC, plus an additional five associated members, and questioned why there was a need for two separate groups in the first place. Critics of the UNFC also said that the Kachin Independence Organisation, which currently holds the chair of the UNFC, dominated the group and thus restricted the agenda’s of other members, including the KNU. Naw K’nyaw Paw said that Karen community leaders against the decision were bewildered by the argument that the KNU could not work within the UNFC framework. This entry was posted in Advocacy and tagged Burma Peace Process, CBOs, community ownership, community participation, Peace Process by Karen Women Organisation. Bookmark the permalink.